Travel Eats documents my food adventures while traveling. Barcelona has been on my food destination wishlist for quite some time now, so it seemed worthy of a three-day visit – can’t argue with an emphasis on seafood, snacking, and sangria, after all. Spain has also been at the forefront of molecular gastronomy, and while legendary chef Ferran Adrià no longer operates the famed El Bulli, his brother Albert still operates multiple restaurants. His more casual venture is Bodega 1900, where we scored a reservation our first day in Barcelona. Bodega 1900 is a modern nod to the old-school vermuteria, so naturally the first thing we ordered was house vermouth. I don’t know that I’d ever had vermouth on its own before that day, but after two glasses I was completely enamored with how drinkable it was, and how well it paired with all the tapas dishes. We opted for the chef’s tasting, and the first dish that arrived was an Adrià classic: liquid olives, which capture the essence of olives using a technique called reverse spherification (here’s a video). Deceptive and delicious. The Russian salad was essentially tuna belly thrown into potato salad (with just the right amount of mayonnaise), and was probably the most comforting dish of the meal. Next, slices of (very) smoked mackerel were lined up like sashimi, simply dressed with salt and olive oil. It was just the kind of no-frills seafood snack I had envisioned. I always love seeing skate wing on a menu, and these were coated in an adobo-seasoned batter, then lightly fried. 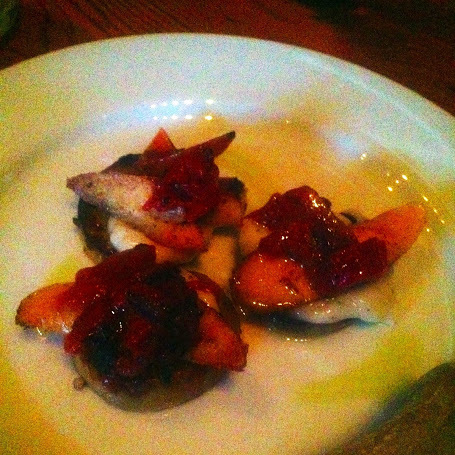 They were almost like skate fritters, the outer crust playing well with the dense fish inside. Perhaps the most indulgent dish of the meal was cured, paper-thin beef tenderloin that melted in your mouth to a peppery finish. It was one of the purest forms of beef I’ve ever had. Even the vegetable dishes held more than met the eye. The tomato salad was especially surprising: what looked like under-ripe heirloom tomatoes tossed in salt and olive oil turned out to be balanced and texturally fantastic. The green peas and mushrooms were served in a savory, piping hot broth that I easily could have slurped down as soup. They both made a nice transition into the rest of the tapas dishes. Wandering around large food markets is a highlight for me in any major city (see also Florence and London), so I knew a visit to the gigantic La Boqueria would help fight first-day jetlag. While it’s debatable whether complete sensory overload is better or worse while jetlagged, we managed to sample several items. My favorites were the cone of smoky, marbled jamon iberico and a pineapple-coconut juice blend from one of the (shockingly ubiquitous) juice stands. 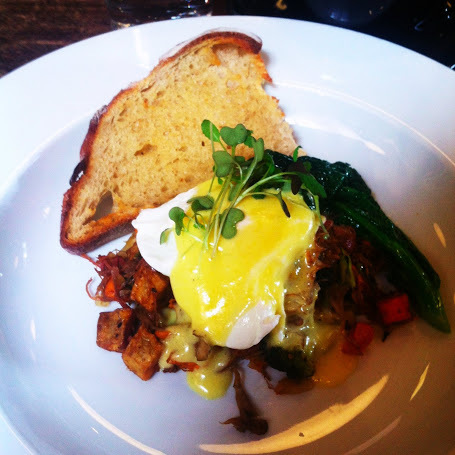 Brunch isn’t necessarily a traditional Spanish concept, but it does fit well with the relaxed lifestyle. I went with the day’s entree special at Ugot Bruncherie, and it combined several of my favorite flavors: smoked salmon, spinach, creme fraiche, and pancakes, which were pink-dyed and faintly savory from beetroot. Between that and the frothy, cocoa-dusted cappuccino, I was quite content. We decided to take dessert to go, so we could enjoy it a little later in a nearby park, and that may have been one of the best decisions all trip. The buttery alfajor cookie held a layer of dulce de leche and a swirly crown of gooey, super-sweet, coconut-dusted meringue. It was messy, but so worth it. And of course, you can’t visit Barcelona without snacking on churros. I didn’t end up trying the traditional chocolate-dipped variety, but the Nutella-filled version across the street from the (staggeringly beautiful) Sagrada Familia was weighty and decadent enough for me. And while I didn’t previously associate Spain with pastries, I was impressed by the variety available. My favorite was a flaky croissant filled with white chocolate from a bakery near Barceloneta Beach. For our last night in Barcelona, we booked a tapas tour through Airbnb. Our guide, Marwa, led us to four different places and weaved lots of history into her explanation of the food and drink we were sampling. We tasted classic tomato toast at one cozy tavern, then made our own at our last stop, a 16th-century bodega where we also tried five different cheeses and five different meats (including a rare, high-quality jamon iberico). It was an excellent overview to wrap up the trip. Viladomat 138; Xurreria Sagrada Família, Plaça Sagrada Família 26; Baluard Barceloneta, Carrer del Baluard 38; Tasca El Corral, Carrer de la Mercè 17; Bodega La Tinaja, Esparteria 9; all Barcelona, Spain. This is part of a series of posts about my vacation to Portland, Oregon, in late February 2013. 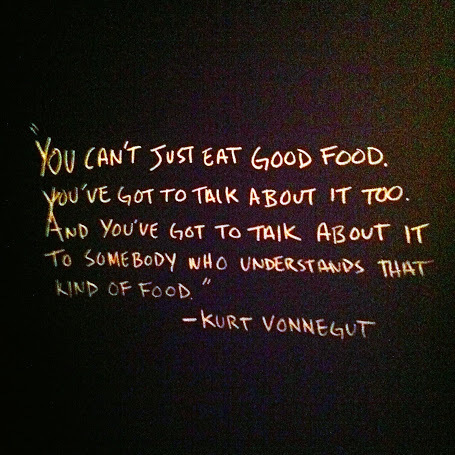 A quote on the chalkboard wall at Beast – words to live by! As I said on Twitter, I would consider this the best overall brunch experience of my life. I knew going into it that a four-course brunch (yes, that’s four courses) from one of my favorite chefs on Top Chef Masters would be nothing to scoff at, but there was so much else that came together to make the atmosphere extra-special. Both brunch and dinner at Beast are completely seasonal and change weekly based on that week’s market, so the prix fixe menu that’s posted outside the door is your first glimpse of what you’ll be eating, with no substitutions allowed. While I realize it isn’t for everyone, it probably goes without saying that I am always excited to eat this way. Although Chef Naomi was in Miami for the weekend, her staff treated us 24 or so diners with the utmost care, ushering us in right at 10 a.m. and meticulously plating each course in the open kitchen that comprised nearly half of the intimate space. In the other half, two large communal tables were filled by a collection of food-lovers from all over the country. Speaking of those fellow diners…in a fun coincidence, the party next to us was a couple from the LA-area and their two daughters, both of whom happened to be Northwestern alums, and the older of whom was even in my graduating class! Once we started to recognize each other and talk through our mutual friends and connections (with a little help from Facebook), it became even more startling that two people with so much in common just happened to be seated together at brunch all the way in Portland. Beyond that, it was just a delight to be around so many other foodies – including this one, with an extensive knowledge of food in most major cities and a great Twitter presence – and sharing the experience with people who wanted to soak it in the same way, iPhone-photo-snapping and all (no doubt this restaurant has inspired its own Portlandia sketches). Of course, the food itself was equally excellent. 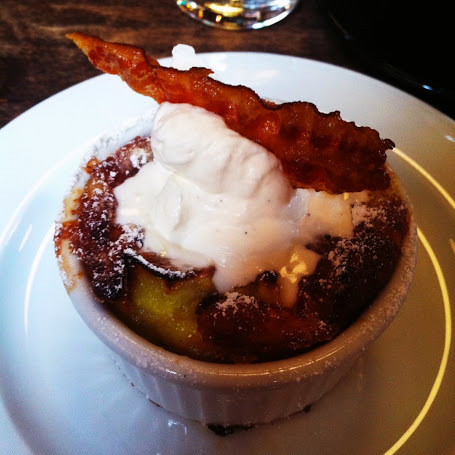 To begin, the bacon-topped claufoutis was airy with lovely apple flavor – I tried to savor each spoonful, but I’ll admit that it went quickly. The hash combined so many of my favorite savory brunch ingredients that I felt as if they’d read my mind: duck, sweet potatoes, brussels sprouts, broccoli, mushrooms…a mixture that was rich, balanced, and all-out delicious. 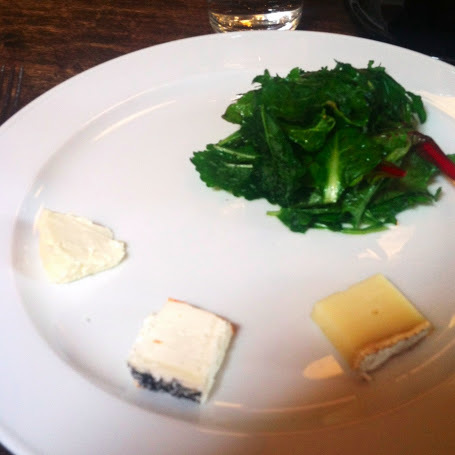 Next up was a plate of three outstanding (and very different) cheeses that were paired with greens so flavorful and nicely dressed that we could barely stop talking about them. 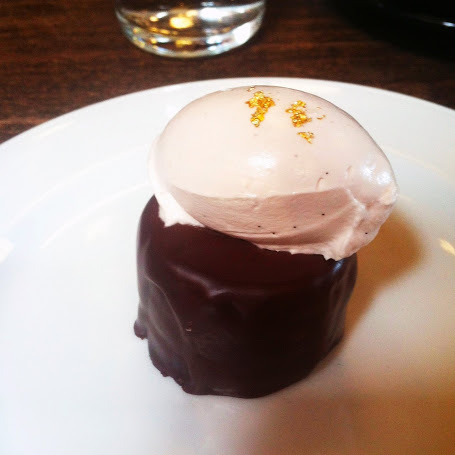 And finally, I now dream of wrapping up every brunch with a smooth, ultra-dark chocolate stout cake cloaked in more chocolate and topped with gold-leaf-flecked chantilly cream. If this is what Beast’s morning meal is like, I’d love to go back someday for a six-course dinner, and make a few more new food-fanatic friends. The details: Beast, 5425 NE 30th Ave.
Toro Bravo draws crowds for its imaginative tapas, so we had to see what the hype was about. We got there right as the restaurant opened for dinner and claimed a seat at the kitchen counter, which was a fun way to see how some of our food came together and listen to the expedite process and general flow of the kitchen. I was genuinely impressed by most of our dishes, and understood why this place had developed a strong following. The boquerones, for example, were treated as exactly the salty delicacy they should be, served atop piperade with such depth that it felt like it had to have been simmering on a grandmother’s stove all day. I was also a little obsessed with the baked polenta, which was basically the best qualities of a cheesesteak and creamy grits rolled together into one. Great cocktails and attentive service as well. The details: Toro Bravo, 120 NE Russell St. 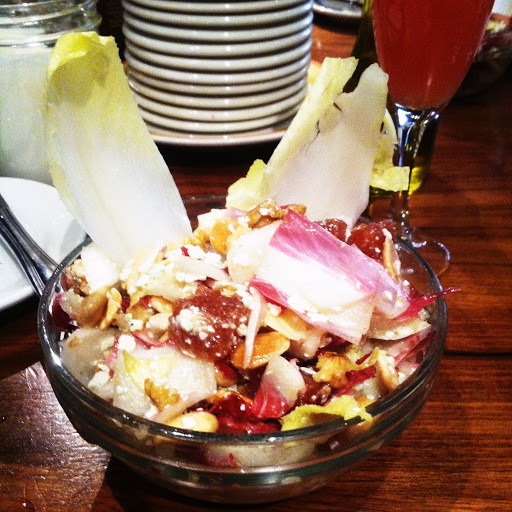 This is part of a series of posts about Chicago Restaurant Week, held February 1–10, 2013. 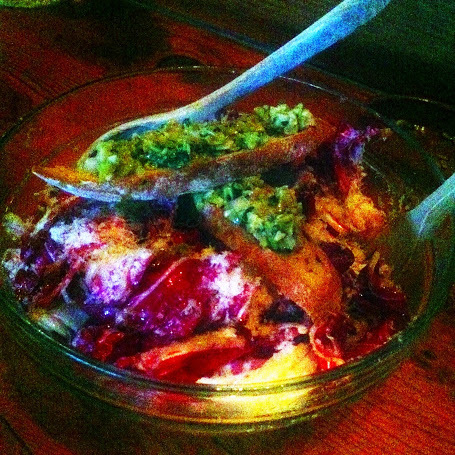 Best Bite: The generously portioned endive salad was a unique start to our lively meal. Amid the tang of blue cheese and vinaigrette, I especially appreciated the membrillo (sweet quince paste) and marcona almonds. Colorful, too – especially with my pomegranate mimosa as a backdrop. See full menu. 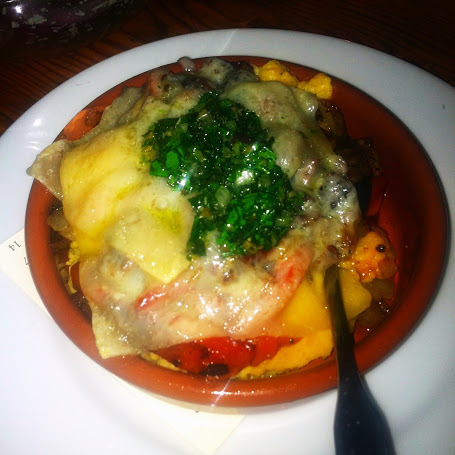 Other notes: Definitely the best value of the week, with soup, bread, cold tapas, warm tapas, and dessert for the $22 lunch price – it was the first time I took home leftovers! 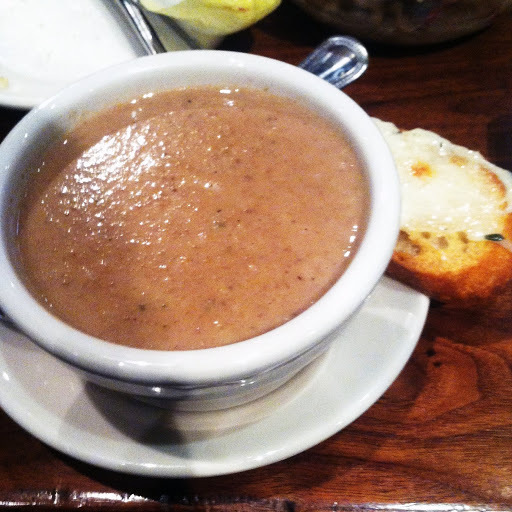 Speaking of the soup, it was creamy, comforting mushroom, with a manchego toast that made it feel almost like a Spanish version of french onion soup. Also enjoyed my petite caramelized banana dessert, with lots of crushed pistachios. Cheerful, bustling atmosphere as always. The details: Cafe Ba-Ba-Reeba, 2024 N Halsted St., Chicago. 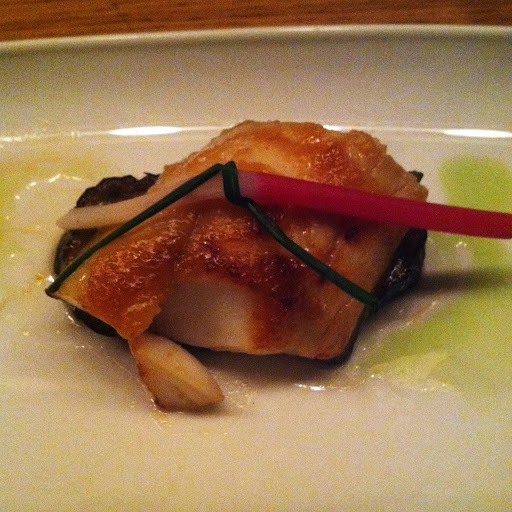 Best Bite: So many fun courses at Sunda, but I couldn’t get enough of this miso-bronzed black cod. Don’t let its plain appearance fool you: the buttery fish was ultra-flavorful from the miso and red curry, and the glazed eggplant underneath was a revelation for this eggplant skeptic. It also served as a nice contrast to pork belly sticks in the previous course, and left enough room for me to enjoy my chocolate mousse for dessert. See full menu. Other notes: Besides the great food, our group of 8 also thoroughly relished Sunda’s exotic cocktails. Of all the varieties, the Grass Tiger (below) was the clear winner for me. I adored the heat of jalapeño-infused gin with cool ginger beer, mint, lemongrass, and more citrus. 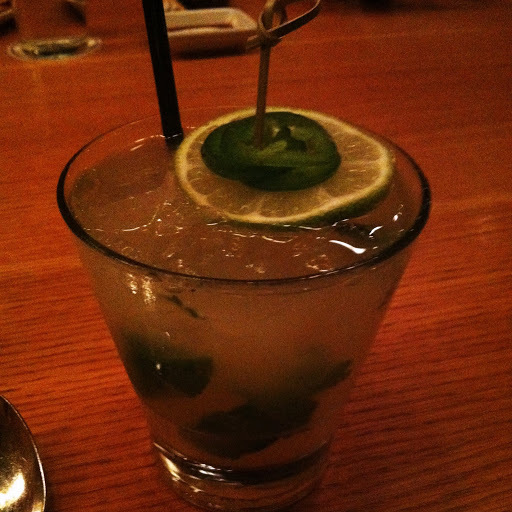 You can even check out the restaurant’s Vine video of a bartender mixing this delicious drink. The details: Sunda, 110 W Illinois St., Chicago. 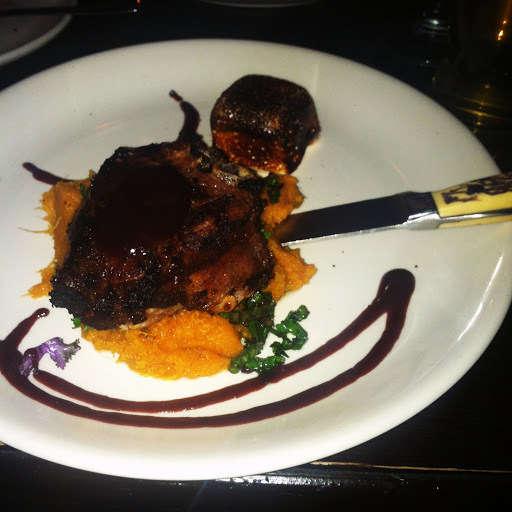 Best Bite: When I saw all the game meat featured on Frontier’s gastropub-y menu, I knew I’d go straight for the wild boar chop. I loved the flavors of the meat and sauce, and with the sweet potato puree, toasted marshmallow, and crispy kale, it was basically a hunter’s Thanksgiving. See full menu. 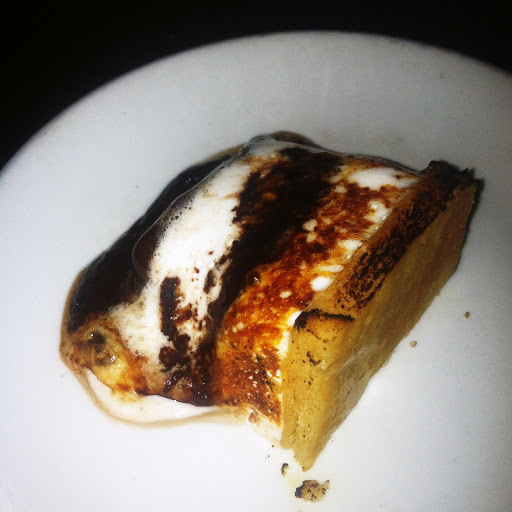 Other notes: Duck tacos and antelope meatballs with gnocchi were both tasty starters, and Frontier pulled off its s’more dessert with just the right level of char and melty chocolate. Great beers and cozy fireplace too. The details: Frontier, 1072 N Milwaukee Ave., Chicago. Each day in December, I’m celebrating my best bites (and sips) in 2012, posted in chronological order. Why it’s a Best Bite: I’ve recommended Tavernita over and over for its lively atmosphere, killer kegged cocktails, and array of creative tapas dishes. 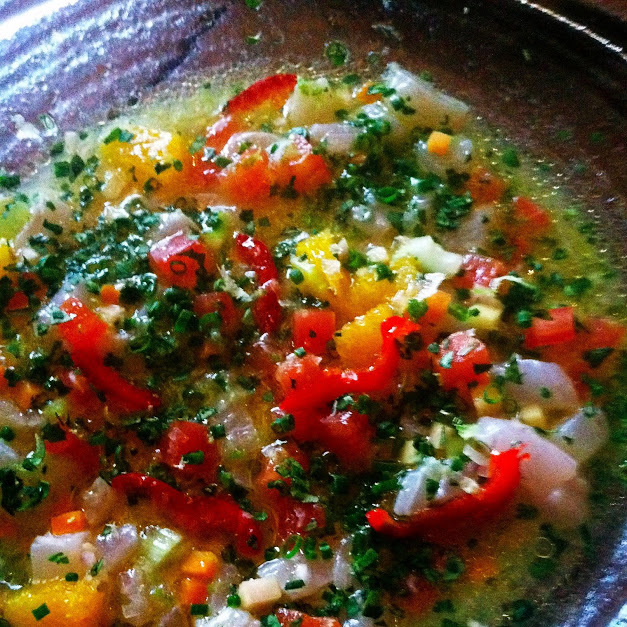 This clean, citrus-packed ceviche was a pleasant complement to richer offerings (don’t miss their pork belly bocadillos), and seemed to capture the colorful spirit of the restaurant. 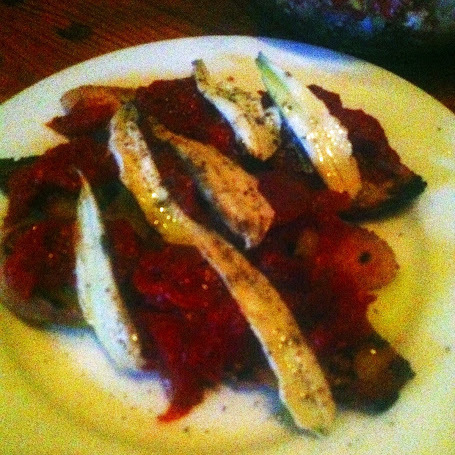 The details: Tavernita, 151 W Erie St., Chicago.